Opening his visit to Italy, Tillerson traveled up a winding mountain road to Sant’Anna di Stazzema, the Tuscan village where the Nazis massacred more than 500 civilians during World War II. As he laid a wreath at the site, Tillerson alluded to the chemical attack in Syria last week that triggered retaliatory U.S. airstrikes. Tillerson’s visit to Europe has been overshadowed from the start by President Donald Trump’s decision to punish Syrian President Bashar Assad for using chemical weapons by launching cruise missiles at a Syrian air base. The U.S. military action has renewed the world’s focus on Assad’s fate and on Syria’s civil war, now in its seventh year. The top American diplomat plans to use his meetings with foreign ministers from the Group of 7 industrialized economies – normally a venue for wonky economic discussions – to try to persuade leading countries to support the U.S. plan. The centerpiece of that diplomacy will come Tuesday morning when Tillerson takes part in a meeting of “likeminded” nations on Syria, including several Arab nations invited to attend. The Trump administration is hoping that after defeating the Islamic State group in Syria, it can restore stability by securing local cease-fires between Assad’s government and opposition groups that allow local leaders who have fled to return and by restoring basic services. The next step would be to use U.N. talks to negotiate a political transition that could include Assad leaving power. From Italy, Tillerson will travel to Moscow, becoming the first Trump administration official to visit Russia. That trip, too, is fraught with tension over Syria: Tillerson has blamed Russia, Assad’s strongest ally, of either complicity or incompetence for allowing Assad to possess and use chemical weapons. During his first day in Italy, Tillerson plans to meet Monday with foreign ministers from the U.K. and France before the G-7 summit formally opens. 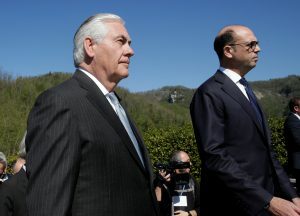 Left: U.S. Secretary of State Rex Tillerson (L) and Italy's Foreign Minister Angelino Alfano arrive to attend a ceremony at the Sant'Anna di Stazzema memorial April 10 in Italy. Photo by REUTERS/Max Rossi.